A review of learning technology, tools, and trends from a not-so-cutting-edge practitioner. It is that time of year again. 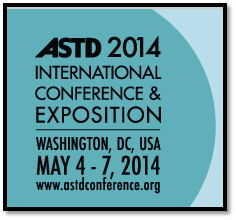 Learning & Development professionals from all corners of the globe make their annual migration to attend the ASTD International Conference & Exposition (aka ICE; aka #ASTD2014). This year's event is in Washington DC. It offers a great line up of key note speakers, hundreds of concurrent sessions to choose from, and more learning vendors assembled in one place than you can ever possibly want to see. Like many of my industry colleagues, I'm looking forward to exhausting myself trying to get as much out of the event as I possibly can. (Here are my key takeaways from last year's conference.) For many of us, that means spending a lot of time in rooms that have rows of chairs facing a dais with a jovial speaker presenting information using a PowerPoint presentation on a giant screen. It is ironic, that this is the primary format for session delivery in a conference that is focused on learning. Granted, this is a conference, not a learning event per se, but we do all go there to learn something. If you are looking for a break from the rows of chairs, and you want to really learn something. Check out one of the four sessions being hosted by the ASTD Forum. The Forum is a consortium of senior learning professionals from about 50+ member companies who connect to collaborate and share best practices on learning. I'm in my third year of membership and it has been richly rewarding for my company and for me personally. The Forum Sessions at ICE offer a true learning experience. When you walk into the room, you will notice the difference immediately. The Forum sessions are set up with round tables, not rows of chairs. There is interaction and engagement between the participants and with the facilitators. You'll leave with tangible takeaways. They are all being held in room 101, so please come by and check one out. But you better get there early. Like all good learning events, we limit group size to ensure participants can maximize their learning experience. In my 20+ year career, I have have held positions as a stand-up trainer, e-learning course developer, instructional designer, management development specialist and training director. I currently lead a global learning shared services team. Like many workplace learning professionals, I'm constantly bombarded by vendors and the media with suggestions on the latest trends and technology tools for learning. I try some things out, but not everything is a fit for my company's needs or budget. This blog helps me reflect on and sort out these experiences. It is my hope that some of these reflections can be helpful to other workplace learning professionals.